Hotcakes are pancakes, they are just called differently across regions of the world. This recipe is a twist off from the classic 'Japanese Hotcakes'. 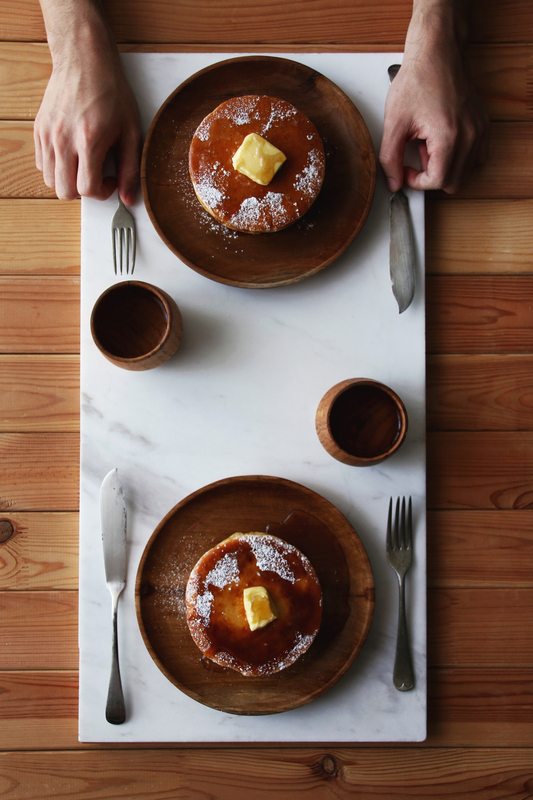 If you haven't yet tried the Japanese version of pancakes, you definitely wouldn't wanna miss this out. It's so fluffy, tasty & easy with just a few simple ingredients, you're able to whip this up at home whichever country you reside in! There are 2 main key ingredients in this recipe. The first, instead of vegetables shortening, I added in brown butter for the extra caramel fragrance. For the second ingredient, if you've been following my blog, you'd realize I love to add yogurt in most of my sweet recipes. That's because yogurt really help to smoothen out the texture in almost any pastries/pancakes you're making. If you're wondering how Japanese Hotcakes always look so perfectly fluffed and tall. Well, you can't possibly get that without the help of a 'MOLD'. Yes, you need a circular mold (D4.7" steel mold) for this if you want it to look super fluff like mine. If you do not have one, don't worry, you can still make this like any other hotcakes, just not as tall and fluff, but taste equally awesome. First, we need to get brown butter by melting butter in a saucepan and cook it over medium low heat. Please be very careful with the heat as butter burn easily. Keep stirring to prevent the particles in the melted butter from burning. When the butter starts to turn brown & fragrant, adjust the heat to the lowest possible to avoid burning. When the melted butter turn fully brown, off the heat, pour into a bowl & leave it to cool. Sieve dry ingredients - cake flour & baking powder into a mixing bowl. Next, combine the wet ingredients together in a separate bowl - eggs, yogurt, milk, brown butter, sugar. Make a small well at the center of the sieved flour, and pour in the wet ingredients. Slowly incorporate the wet & dry using a whisk or spatula. Combine well until there are no lumps & do not over mix. In a non stick pan on medium low heat, spray non stick oil or pour in a tbs of oil and use paper towel to absorb the excess and spread evenly. Sit the mold right at the center of the pan, and ladle in the hotcake batter to the desired height(the higher the hotcake the longer it will take for it to cook evenly). I ladled mine to about 1" height. Cover it with a lid, turn the heat to low and let it cook for about 10 minutes or so till the surface no longer mush. Using a kitchen glove, take the mold out & run a knife around the rim on the underside of the mold (so it doesn't stick), carefully turn over and cook the other side till brown. If you're not using a mold, simply ladle in the amount of batter of the desired size over medium low heat. Once the surface starts to form small bubbles, turn it over and cook the other side till brown. Leave it on a cooling rack before serving. 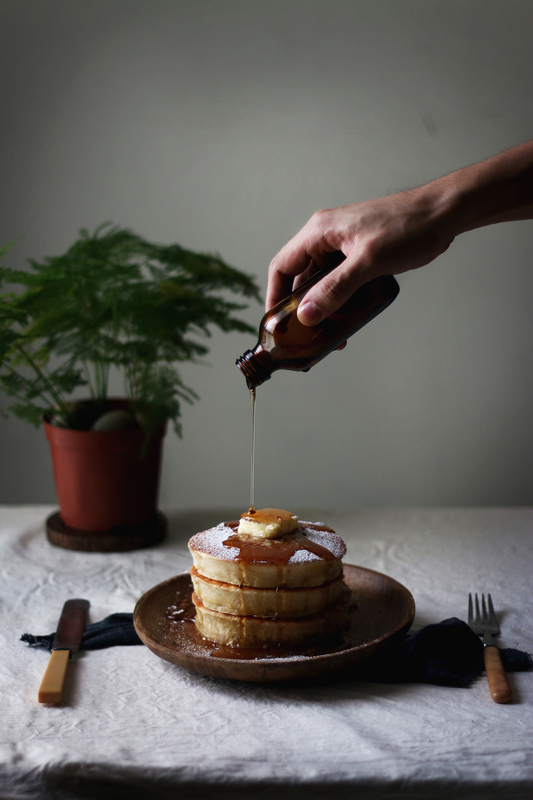 Dust the hotcakes with icing sugar, serve it with a knob of butter and maple syrup. Best to serve this warm!